Dean Cain presides over the proposal as Ruby Rinekso asks Jennifer Haviland to marry him. Dean Cain hasn’t played Superman for 15 years, but he’s still a hero for many fans. The actor, charming as ever, made the ATL geek fest especially unforgettable for Ruby Rinekso of New York, who was planning to propose to his girlfriend, Jennifer Haviland, at the convention. Rinekso, 39, wanted to pop the question to Haviland, 33, during the DC Comics Characters Photo Shoot, where con-goers dressed as characters from the DC franchise (including Superman) gathered. The couple had been together for 11 years, and were dressed as Batman and Batgirl at the photo shoot. Rinekso got permission from Allen Lee Hansard, head of The Superhero Costuming Forum, to do the proposal then. Three of Rinekso’s friends, aware of his plan, said they would try to get Cain to attend the September 1 photo shoot and hand him the ring. Rinekso doubted this would happen - “whatever, go ahead and try, but make sure my ring gets back to me,” he thought. Just as he was about to give up hope, he heard, "Will you please give a round of applause to Dean Cain!" He uploaded an adorable video chronicling the experience to CNN iReport. The next day, at Cain’s fan panel, Rinekso shook Cain’s hand and hugged him. The crowd wildly applauded and cheered as Cain recounted the proposal. Remembering the “Lois & Clark” audition process, he said that he had to kiss 12 different women trying out for the part of reporter Lois Lane, and that Teri Hatcher (now also famous for “Desperate Housewives”) was the last one. “She was certainly the best kisser of the bunch, and she was the best actress of the bunch. I knew that it was hers,” Cain said. Cain, 46, revealed to the audience that he’s single, much to the excitement of female fans. He has a 12-year-old son named after his adoptive father Christopher Cain. You can also see Cain on “Stars Earn Stripes,” a reality show where celebrities play for military and veterans charities. His partner on the show is Navy SEAL Chris Kyle. So who are Cain's real-life heroes? One fan wanted to know. she can be considered one...however because she's not well we continue too let it go however its our job too stay away. The next time I read a blog, Hopefully it doesn't fail me just as much as this one. I mean, Yes, it was my choice to read, but I truly believed you would probably have something helpful to say. All I hear is a bunch of moaning about something you can fix if you weren't too busy looking for attention. I agree-however the first step for me is too get off this blog...your more painfully shy then before–not with the boys of course but you seem shy and less confident then before...come over sit down and lets forget all these bloggers trying too mess it up all the time–no more blogging for me.....I am shy a bit don't know why but if you return i'll never shut up! I truly love your blog.. Excellent colors & theme. Did you make this web site yourself? Please reply back as I’m hoping to create my own personal blog and want to learn where you got this from or just what the theme is called. Cheers! Aw, this was a really good post. Spending some time and actual effort to produce a very good article… but what can I say… I procrastinate a lot and don't manage to get anything done. After I initially commented I seem to have clicked the -Notify me when new comments are added- checkbox and from now on every time a comment is added I receive 4 emails with the exact same comment. Is there a way you can remove me from that service? Many thanks! EC girls want this guy. Just goes to show you that Dean Cain is a class act. A nice guy, who played a nice guy who happened to have superpower. That probably was not much of a stretch for Dean. Way to Go Dean. Batgirl seems to have a very nice rack! totally my fault i could have smacked for 3yrs .. i just broke up with a bf..wasn't ready.. i guess..
a person can be afraid so they find excuses..the day it walks out .. .its gets cornered for a smackstick...remember what i said. 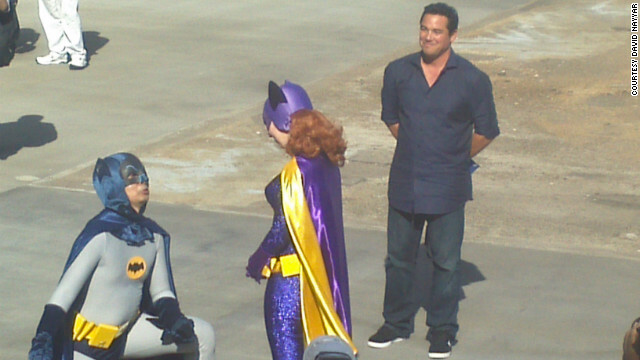 dean cain was a good sport about this. Agreed. It's nice to see celebrities who are willing to give something extra to their fans just because it's the nice thing to do. Yeah, I agree with you. He does seem like a very authentic guy. That's why he still has the fan base that he does. Kudos to Dean Cain.